Apple customers who participate in Apple's iPhone Upgrade Program and are planning to buy an iPhone X can now use the Apple Store app to get pre-approved for a purchase ahead of iPhone X pre-orders. Pre-approvals will be available for a limited amount of time. To initiate the pre-approval process, customers will need to download the Apple Store app and choose their preferred iPhone X model to get their loans approved before pre-orders go live this Friday. The process is designed to make it easier for customers to get through the checkout process when pre-orders kick off. When pre-approval has been obtained, iPhone Upgrade Program customers can use the Apple Store app to complete an iPhone X purchase once pre-orders are live. According to the Apple Store app, pre-orders will begin at 12:01 a.m. Pacific Time on Friday, October 27. Apple's iPhone Upgrade Program is designed to allow customers to upgrade to a new iPhone after at least 12 payments have been made towards an existing iPhone. The Upgrade Program, which includes AppleCare+, requires customers to trade-in their current phones to get a new phone. iPhone Upgrade Program members are able to use a Trade-in Kit this year to return their existing devices to Apple, alleviating the need to visit an Apple Store to purchase a new device. iPhone Upgrade Pricing on the iPhone X costs $49.91 per month for the 64GB model and $56.16 per month for the 256GB model. Upgrading to a new device through the iPhone Upgrade Program last year was a hassle because customers were required to reserve a device at a local retail store and supply was limited, but this year, iPhone Upgrade Program customers will go through the same order process as other customers. 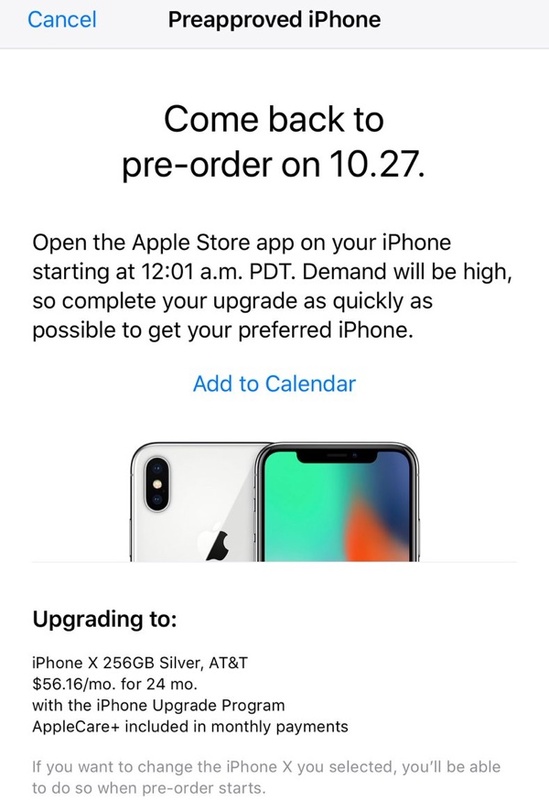 Though the wording makes it sound like iPhone Upgrade Program customers will be able to pre-order more quickly than others, that's not the case. This process offers pre-approval for the credit check portion of the iPhone Upgrade Program and does not otherwise speed up pre-ordering. A fast and easy upgrade process will be essential this year, as rumors have suggested the iPhone X will be in seriously short supply. Available iPhone X stock is likely to sell out quickly, perhaps within minutes of when pre-orders go live. There may be a long wait for an iPhone X throughout the rest of 2017, with supply picking up during the first few months of 2018. Following pre-orders on October 27, the first iPhone X devices will ship out to customers on November 3. Hopefully a speedy process for those of us just paying full upfront. False, it is a soft pull IF you are already a member of the IUP. If you are applying to the IUP for the first time, it is a hard pull. For those of us that went through the pre-approval process for the iPhone 8 pre-order can you describe your experience? What happens when I open up the app on pre-order day if I've been pre-approved? the above article summarizes well the process for the 8 and 8 plus preapproval. This is for existing IUP people from last year, new members will have to enroll on the 27th when chances for server snafus as your credit, carrier and such need confirming and often do not all resolve til later morning. Except that skips over the part everyone is curious about...how does it work to complete the order on the night. Is there going to be a simple icon that will lead you to it or do you have to go to a specific place? I noticed there is a link in the calendar invite it created. Maybe clicking on that is the fastest way to complete the order? Yes, i assume the iphone X pre order will be the same. YOu get pre-approved a few days before, and then the night of, open the Apple Store app at 3:01 am or whatever, and you literally just hit "confirm order." You pick the model and color and everything with your pre-approval days before. Then everything is waiting for you to go, and it literally takes 5 seconds, no joke. It's a small advantage Apple gave IUP customers, but its a bit of an advantage nonetheless. I found this reply in one of the iPhone 8 pre order threads... Not sure if this means confirm order will magically appear when you open the app or what. Right now when I open the apple store app I see the "you're ready to pre-order on 10.27" message at top and it allows me to view pre order. Maybe that will just change to confirm order when it goes live. Then we get to pre order again!!! You really think your **AmaZiiNg** credit is going to be affect by a small phone loan? You must not be well versed in credit then. I don't understand why people have to respond in such ways lol.